Endodontic treatment is a necessary consideration to repair damage to the internal part of a tooth, most often because of previous deep decay. 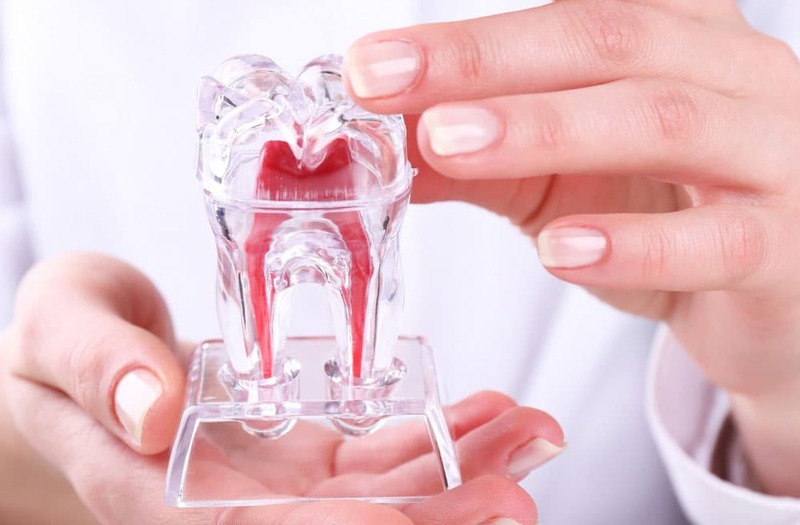 Sometimes trauma or tooth fracture can damage the tooth. Considerable past decay or trauma from an accident can cause damage many years later. While most dentistry focuses on the outside of the tooth above the gum line, endodontics refers to the dental treatment inside the tooth. Below the gum line, the root receives nerve and blood supply from the surrounding bone. This blood and nerve supply within the root is called the dental pulp. It is especially important to the tooth as it develops in childhood. Later when the dental pulp becomes damaged, the tooth can become sensitive. If tooth sensitivity is caused by an inflamed or infected dental pulp, a low dose digital x-ray would be needed to help identify the source of the problem. If the pulp is the problem, endodontic treatment would be recommended. Endodontic treatment removes the inflamed and infected pulp and allows the maintenance of the natural tooth. The tooth can continue to survive without the blood and nerve supply because once mature, nutrients are gained from the surrounding tissue. At Columbus Endodontic Specialists, we specialize only in root canal therapy to help patients maintain their natural teeth.